Available as an option on the Deckert and Cremer range of counting machines, this Broken tablet detection system can identify broken tablets, fragments and rogue or miss-coloured pieces. When a broken piece has been identified there are a number of options available to the customer: The tablet in-feed can stop to allow the operator to manually remove the broken piece from the track, the filling machine fill the broken piece into a container and then automatically reject the bottle in which the broken piece has been filled or an automatic reject system can remove the broken piece from the in-feed track. The fully automatic reject system represents a revolution in automatic broken tablet detection. Especially for large counts or fragile tablets the ability to automatically reject only the broken tablet vastly increases yield on the line. At Interpack 2017 Cremer and Deckert both showcased Cremer counters with camera inspection systems and automatic reject of individual capsules. Camera detection of broken, rogue or discoloured tablet or capsules is nothing new, however previously reject took place either manually or a container was rejected. To ensure the rejected tablet or capsule was rejected often more than 1 container was rejected. 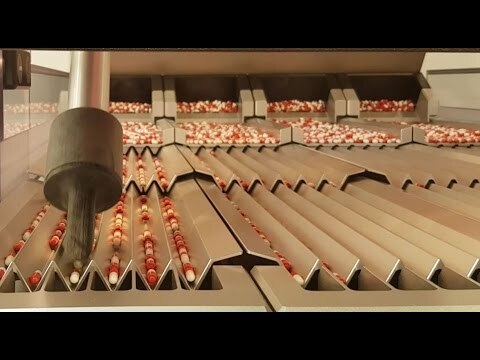 The new automatic broken tablet rejection systems presented at Interpack involved pneumatic suction systems that automatically removed the defective tablets or capsules from the infeed tracks. This new approach maximises yield while minimising downtime.